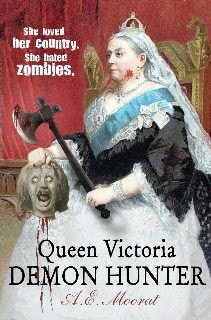 To coincide with the release of A. E. Moorat's Queen Victoria: Demon Hunter, a "blood-curdling and hilarious historical zombie mash-up novel" and "alternative history . . . packed full of blood, guts, and flesh-eating zombies," publisher Hodder & Stoughton is sponsoring a short film competition. Send them your Victorian-inspired zombie short film or animation and you could win £100 of Hodder books. For information and a look at the first chapter of the book, click here.